A lot of people don’t get the opportunity to spend as much time as they would like out in the gardens on a day to day basis. Work, family routine and sport on the weekends mean these are all times spent away from the home during daylight hours. When you do get to relax after the days tasks are completed, it would seem only right that you get to enjoy some time in a garden that is functional even though the sun has gone. What type of light source works best? Powder coated, stainless, copper or brass fittings? Do you want the lights to come on together or in certain groups? Which outdoor and garden features to be lit and how to light them? Is the lighting intended for mood or function? Incandescent globes have been around for many years. They are reliable but have the highest power consumption. Halogen globes use about a third less energy than incandescent globes. However, they generate a lot of heat, so they have to be placed carefully to avoid ‘hot spots’. Also be very careful when replacing halogen globes and make sure you are not touching the lens as the oils on fingers can damage the globes. Whilst LED’s technology has been around for close to a century, it is not until the last decade that the technology has really progressed. The biggest and most publicized advantage to LED lights is the fact that they use considerably less energy than other light sources. They don’t generate as much heat and are available in a range of colours. So, it’s easy to see why LEDs are fast becoming the most popular light source on the market. Fibre optics are an exciting way to use light as it can be utilised in many different ways to create dramatic effects. The light travels down the cable and is reflected off the inner wall of the cable meaning light can travel great distances. Since the fibre is non-conductive and the power for the light source can be placed in a safe location, fibre optics are great for underwater lighting such as in swimming pools or fountains. When it comes to the finish of the fitting – the range is vast. The style of the house and garden often dictates the choice of finish. Contemporary and modern themed homes and gardens often benefit from stainless steel or powder coated finishes and smooth clean and simple shaped fittings. On the other hand, the older colonial, Georgian and federation homes will often look best complimented by brass and copper finishes and fittings that are more ornate. Besides changing a globe when required and the occasional wipe, the need for any extra maintenance on any of the finishes is superfluous. Stainless steel fittings will sometimes get ‘tea staining’ which is a brown discolouring of the surface. This is more prominent in coastal and high pollution areas. It doesn’t affect the structural integrity of the fitting and can be combated by washing the fitting with warm soapy water. Copper and brass fittings will patina over time, but this is not a structural or mechanical issue of the fitting but merely a harmless and naturally occurring process of the material. Depending on the lighting you choose and your specific needs, you can have an auto on function, a timer, a motion sensor or a manual switch. Work with your landscape designer from the beginning to decide on the right lighting option for your garden and outdoor space. Don’t forget to take into consideration the maintenance and running costs. Garden lighting is an excellent way to bring featured areas of the garden to life in the evening, enhance the scenery and add a whole new dimension to your outdoor space. Create interesting shadows and add texture use up-lighters to highlight small trees and feature plants that have height. These illuminated trees will enhance an entrance and also create a focal point when viewed from inside. Strategically placed uplighters can also make your garden look a lot bigger, as it draws the eye to the outer corners of the space. 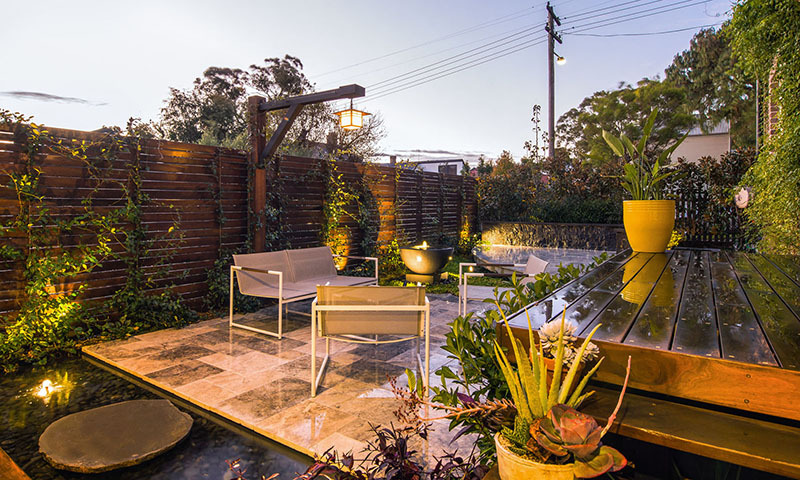 Fences and walls are often overlooked, fit down-lighters that transform them with soft pools of light at night. Choose warm lights and accent with a little pop of colour in unusual spaces, such as under seating, tables or large planters. Festoon lights are great for zoning off your dining or entertainment area and add warmth to the place. Or drape solar light strings all around your garden, up through trees and over the hedge. They come on automatically at dusk and twinkle on for up to eight hours in summer. In conclusion, whether you are only interested in functional light to traverse through your front and rear yards safely or are interested in lighting up features and ‘painting with light’ to create a beautiful and interesting nightscape, careful thought needs to be given to ensure the correct luminaries are used and that they are being used to their best potential. After all, just because a garden is well lit, doesn’t mean it is lit well. Now that you’ve been inspired by our outdoor lighting ideas, it’s time to focus on your own garden lighting design and set the atmosphere for a series of cosy, well-spent evenings in the garden.